Traditions: Growing up every Christmas Eve we would head to my Babci and Dziadzi's house and have the traditional meatless dinner complete with "special" wine. Then it was at my Mum's with the addition of some Italian things. I've taken over night before's feast and have added Ryba W Sosie Chrzanowym. Here is the recipe. It was a hit with our Polish PopUps this year in London. In a large stock pot combine the carrots, celery, parsley, onion, bay leaf peppercorns, salt, and water. Bring to a boil, lower heat and simmer for 20 minutes. Strain the vegetables out of the liquid. Pour liquid back into the pot with the fish on medium heat. Cook for 6-8 minutes. Remove the fish to a plate, cover and refrigerate. Strain the stock reserving 3/4 cup/185ml. Melt the margarine over medium heat in a sauce pan. Add flour stirring to combine. Cook for 2-3 minutes. Add fish stock whisking to prevent lumps. Raise heat, whisking constantly until the liquid becomes thick. Remove from heat stir in the sugar, salt, sour cream and eggs. Place in a container and refrigerate for 15-20 minutes. 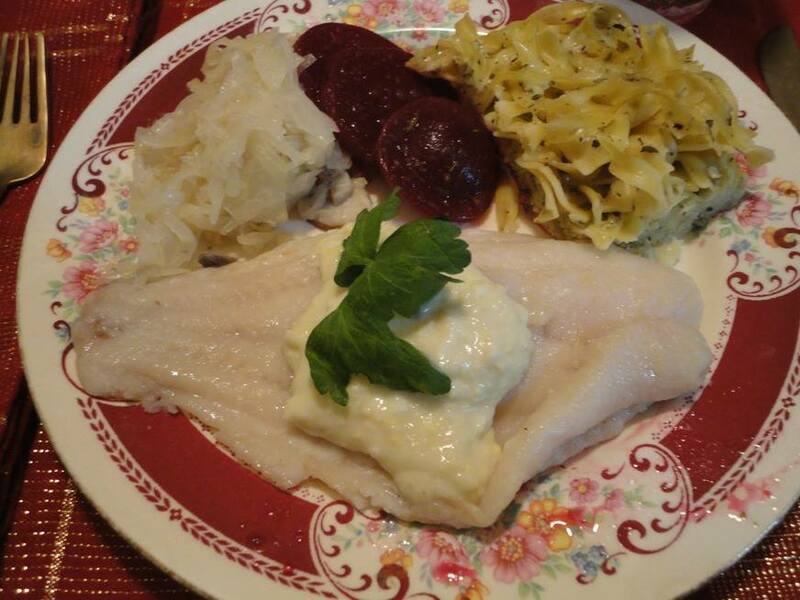 Serve on with the poached fish.